Simply tap, drag and move the Story to change its priority or work flow state. We’ve put powerful organization quite literally at your fingertips with this new feature. With a simple tap, hold and drag, you can now easily re-prioritize Story cards within a workflow state, or move which workflow state they’re in. This addition has made cross-device use of Clubhouse even more seamless. Create a new Story while at your desk, in your desktop browser, and move it to In Development from your iOS device as your plan your work for the week during sprint planning. Move those stories from Ready to Deploy to Completed while on your way home to celebrate launching that new feature. Drag into a GitHub pull request in Safari, and add it to a comment. Share in a Slack channel to talk about it with your team. Add a reminder for you to work on a Story later by dragging it into the Reminders app. With push notifications, you can stay up to date with the Stories that you care about while you’re on the go. You’ll get push notifications when another user comments on a story you own or follow or @-mentions you in a story. 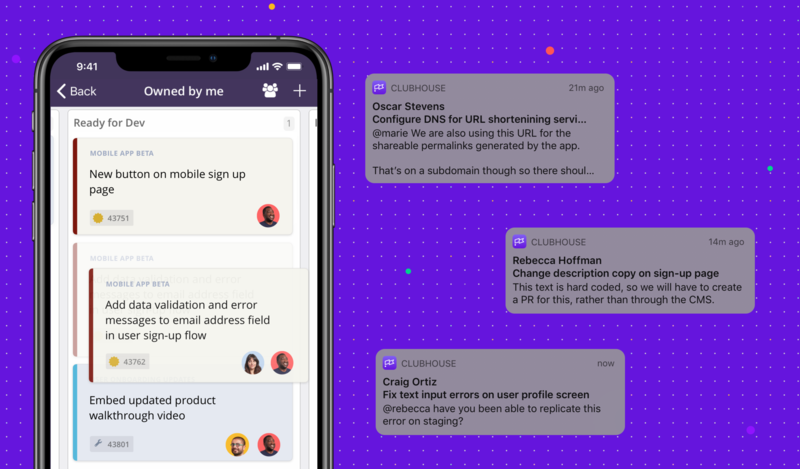 Clicking on the push notification takes you straight to the Story, so that you can dive right in and start collaborating. Clubhouse for iOS users, of course, have control whether or not they receive push notifications — you’ll only receive them if you choose to enable notifications in your device’s settings. Photos can be added directly from the iOS Camera Roll with a few taps. Say you’re jamming in a meeting and want to quickly share a record of a whiteboard diagram from the session. Or maybe you’re browsing the mobile version of your app or site, and notice a bug. Now, with the ability to to upload images or screenshots directly to Stories from your iOS device’s Camera Roll, your ideas are quickly shared and accessible by everyone. Enhanced mobile security with SSO, for Enterprise Customers. Clubhouse recently launched its Enterprise Edition which provides, amongst a number of other great features, enhanced security with SAML Single Sign-On (SSO). In case you missed it, Clubhouse for iOS extended that security to mobile by including the ability to login with SSO on your iPhone. Get in touch if you’d like to learn more about Clubhouse Enterprise Edition. We hope the enhanced functionality of Clubhouse for iOS makes it even easier for your to create on the go. As always we really welcome your feedback to make it even better. From the app, just shake your device to send us feedback, or send us an email at mobile@clubhouse.io.